When I sat down at the kitchen table this morning there before me was a pan of freshly caught rats complete with all their furry coats and long tails inviting a repulsive gesture on my part. It all took place in the small village of Bangta-ngai in Banphot Phisai in the province of Nakhon Sawan central Thailand, where I live with my wife Na, and the three children Dow, Dune and Gada. Coming from San Francisco and having been weaned on Western European cuisine, with a good bit of the mixed cultural cuisine called California cuisine, I was very unprepared on how to react to these rats on the table directly in front of me. But there they were, big brown furry rats just lying there awaiting to be prepared for a delicacy, which this Thai family truly enjoys. It could be barbecue rat, or rats cooked in oil or even chopped rat with chili paste all of which were considerations for a sumptuous meal of rat. The evening came and rat was served for dinner. It actually smelled fairly good so I broke off a piece with my fingers, and began chewing barbecued rat that had a very distinctive hot spicy flavor. I suppose for the squeamish of heart that would be just about enough to make you want to run to the nearest toilet and have a good heave, especially in any American home I have ever been to. I must admit, however, I was astonished at how good the rat meat actually tasted. The cultural hurtle that I had to jump over to gain the social grace to eating rat meat was truly monumental with a severe sense of obligation at being polite in front of the family at the dinner table. Swallowing your pride took on a whole new different meaning for me as I swallowed my first bite of rat meat. So dramatic was this experience for me, I thought I would like to tell my story of how I came to gain the confidence to eat my first prepared meal of Thai rat. Early one morning in the village, quite some time before I ever considered eating a rat or any other rodent for that matter, Moat, Na's older brother came to the house with a small hand made bamboo cage containing a small rodent which I came to learn was a freshly caught rat. At first I thought the rat was going to be kept as a pet, but soon learned that the rat was going to be fattened up and then prepared for a special meal. Moat told me that rat meat was a very special Thai delicacy, and that rat meat was a taste treat in Thailand. I pondered his comment as I looked at the rat, and could not help remember all the rats I used to see at the Le Halle market in Paris in the early morning of 1974, or the rats in the subways of lower Manhattan. Rats, the worst mammal alive I thought. The mammal that eats the garbage of humanity, survives extremely well, and adapts better than most living creatures. So, my idea of dining on rat really did not appeal to me at all. I had forgotten about Moat's rat in the bamboo cage until that eventful morning when I saw all those rats in a pail in the kitchen. At first it was a repulsive experience, but with such an obvious display of acceptance by the family with leaving them laid out like a fresh fish kill I decided to be a bit more attentive to these furry dead beats. It was mid January, and the rice fields had about two months to go before harvest. If the rice fields are not tended to properly the rats will eat the roots of the rice plant. 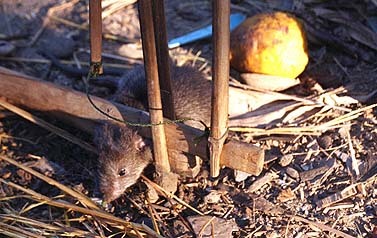 The young tender roots of the rice plants are what the rats like to eat. Rice field rats have quite another diet over their urban cousins. Rice field rats love to dine on rice roots. I became aware of Moat busily working on some bamboo and string, and my father-in-law was also busy burning holes in the thicker sections of bamboo strips using a red hot poker iron. Slowly I figured out that the both of them were making rat traps for the rice fields. I had never seen a bamboo rat trap in my life so I was again intrigued over the sheer ingenuity as well as the determined sustainable lifestyle the Thais have developed around their rice fields which yield far more of a food supply than just the rice. The canals, which irrigate the fields, are full of fish and snails. After the fields have been harvested and burned the ducks come to feed on the fresh grass shoots and lay their eggs. There are a number of species of plant life that is also picked for garnish as well as boiled with other vegetables in soups or mixed with red chili peppers using a mortar and pestle. One is never to underestimate the bounty in a rice field. To say that these rat traps had a hair trigger would not even come close to the real sensitivity of the traps release mechanism. Carefully set on the trap was a small piece of bamboo, very delicately pressed against the main bamboo bar ready to spring shut as the trap was designed very much like a bow. 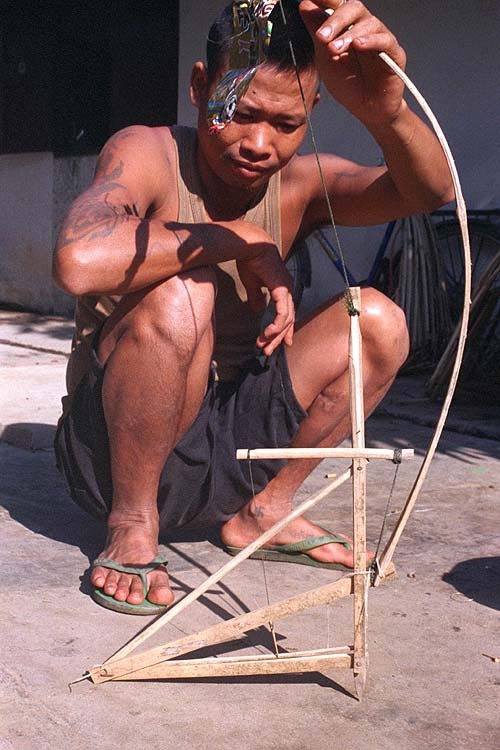 All the rat had to do was just brush against the small piece of bamboo and the bow would spring open pulling the bamboo bar shut. When the rats scampered through the furrows of the rice fields they would very unknowingly, and without any bait to lure them, would run right through the opening of the traps, which were cleverly placed in between the rice stalks. Before the rat ever had a chance to know what was happening it would be too late as the bamboo bar would have instantly come down on his neck. It was very quick, and it was done in the dark of night when the rats could not see the traps. In the morning the traps would all be shut tight, and a full sack of freshly caught rice field rats would be ready for cleaning. The cleaning and preparation for cooking the rat is also quite a process. The small feet and tail are first cut off on a wood chopping block. Then a cut is made behind the ear so that it is possible to pull the fur off of the main body. After that is done the head is cut off as the head is held onto when pulling the fur off of the body. 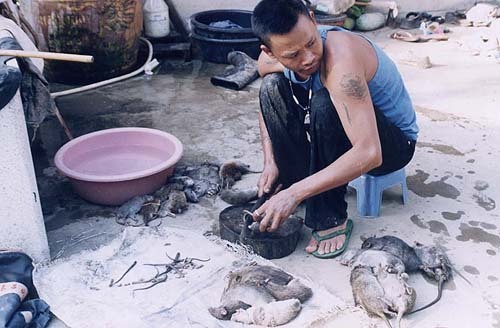 The rat is then washed in water and a cut is made along its belly to remove all the intestines. The liver and the heart are kept inside the body. The rat is then spread open and placed either between a grate for cooking over an open flame and the smaller rats are ready for the wood chopping black. The smaller rats are left on the grill just long enough for the meat to be cooked, but still medium rare. Then the small rats are chopped up very finely on the chopping block, small bones and all, until a sort of fine ground meat is made into a paste. The heart and liver are removed before it is chopped up and placed in a separate dish. 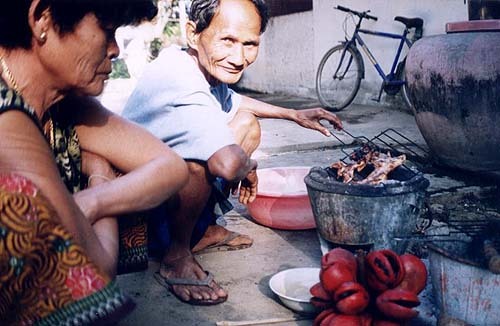 Before the rats are prepared for cooking, about two small cups of red chili peppers are ground up with a mortar and pestle until a red chili paste is made. It is this chili paste that the finely chopped rat meat is added and then cooked in oil in a wok. A great deal of garnish and other spices are added which are mentioned in the recipe at the end of this short story. The larger rats were completely fried with a burnt like look to them as they were also basted with a chili sauce. Once at the dinner table I had to keep in mind I was going to eat a Thai delicacy so my first bite was accompanied by a strange feeling that I was not going to like this delicacy at all. Once the rat meat was in my mouth I began to chew. I was looking for a taste familiar to me so I could not show any signs of rejecting my 1st Thai delicacy. The first taste I experienced was the very distinctive hot chili flavor, which was a welcomed friend to my taste buds, but I knew the rate meat was about to make its appearance on my tongue. The meat was very tender and not at all wild game tasting. In fact the meat was very sweet, very much like rabbit meat or frog legs. I was satisfied I could continue eating my first piece of rat meat, and went about picking every last piece of meat off of the small bones. I decided not to eat any more rat meat at my first sitting, and was even told I would find out later that I would not be able to digest it. Some of my Thai family friends said it was only a joke, and there were no problems to worry about. I really did not know what to expect, but the evening passed and I survived the night with a quiet sleep with no sudden trips to the toilet. It amazes me how we all grow accustomed to food from cultures we are familiar with and how uncertain we feel when approached with a new cultural taste treat. The integration of world cultures definitely could begin with a totally new dining experience. If we can ever over come those differences, perhaps our global differences on larger issues would be more easily resolved. With a mortar and pestle place the 1-1/2 cups of dried red chili peppers, and begin to mash until a red paste is achieved. Add a tablespoon of water to make moist. Place bay leaves in a small bowl of water. Roll two bay leaves at a time and then thinly shred and place in dry dish. Do for all 8 leaves - two at a time. Place holy basil leaves in a small bowl of water. Dice long green peppers. Do small cross sections so look like wheels and place in dry dish. Skin 4 small rats. Clean and place heart and liver in separate bowl. 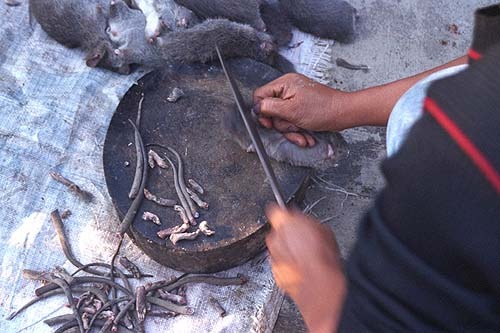 Place small rats in a grate, and lightly cook over an open flame on both sides until medium cooked. Do not cook well done. Mix red chili paste with hot oil and stir well. Finely chop rats on a wood chopping block over and over until makes a smooth ground meat texture. Be sure to chop all the bones well. Add chopped rat meat to the red chili paste and oil and stir well. Add diced green peppers and stir well. Let cook for 5 minutes. Add 1/2 tablespoon of salt. Add whole liver and heart and sir in. Add holy basil leaves to mixture and stir in well and let cook for another 5 minutes. Be sure not to burn the chili paste - add a little water if necessary to keep moist but not runny. Add shredded bay leaves and stir in and cover and let simmer for 5 minutes or more to let all the flavors mix well. Serve ground rat meat on an oval dish with livers and heart on the top. Circle with garnish of basil leaves and halves of lime. Serve with white rice. The flavor will be hot and tangy with a mild crunchy chew to it. It is not to be considered the main dish, but a nice hot and spicy accent to other prepared dishes. Very good on crackers, but Thais do not generally eat crackers. Recipe would not go over well in Peoria, Illinois or Davenport, Iowa.